World class eye care begins with consultation and comprehensive eye examination from our roster of consultants who are well-equipped to cater to patients of all ages and needs. 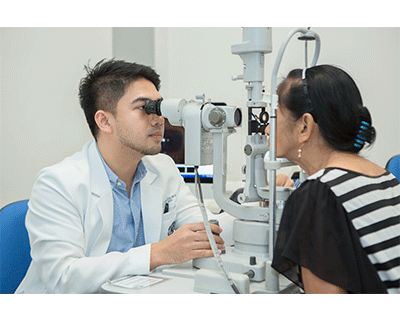 Equipped with state-of-the-art system at par with the best in the world, Manila Doctors Hospital’s Department of Ophthalmology offers a Laser Room with Ophthalmic Lasers and a Fundus Camera. It also has an Operating Room (OR) and diagnostic facilities with one of the best ophthalmic operating microscope systems including an advanced laser technology for in-depth cataract surgery. The diagnostics, housed in the Vision Center, are all equipped with the latest model Zeiss machines which include a biometer, a retinal camera and a visual field analyser. The department aims to strengthen subspecialty training and delivery of high-level subspecialty care, as well as to constantly modernize its facilities to complement the expertise of its highly trained specialists.